Despite the picture on the book's cover showing a caravel at sea, The Secret of the Unicorn keeps both feet firmly on the ground. We only breathe sea air through the story of Sir Francis Haddock and Red Rackham. In the sequel, Red Rackham's Treasure, there is a change of scene as we embark on a thrilling maritime adventure. But that's another story and another adventure to look at under the microscope. In the opening frames, we see Tintin strolling along in his home-town of Brussels, more precisely, in the old market, affectionately nicknamed 'the flea market' by locals and located in the heart of the Marolles district. In the later, colour version, Hergé was addressing the wider French-speaking world, and for this reason the local Brussels dialect had to be dropped. Hergé paid another tribute to the city of his birth, in the first frames of The Red Sea Sharks, where Tintin and Haddock walk up the Avenue de la Toison d'Or, a famous Brussels street. The Secret of the Unicorn was the first of Tintin's adventures to be conceived as two separate episodes. This was apparent from the first appearance of the story as a series in a newspaper: just over a month separated the last strip of Unicorn (14 January 1943) from the first strip of Red Rackham's Treasure (19 February 1943). Another 'picture series' of the time, Juck & Jimbo apprennent l'histoire (Juck and Jimbo learn history) by J.-P. Kime, was split into two parts. Tintin's subsequent adventure, The Seven Crystal Balls, also had a sequel: Prisoners of the Sun. Later on, Explorers on the Moon (which, when published under the French title On a marché sur la Lune in Tintin magazine, was the single title covering the whole Moon adventure from its beginnings in Syldavia) would be split into two stories: Destination Moon and Explorers on the Moon. It is only at the end of Red Rackham's Treasure that readers get to see the exterior of Marlinspike Hall. In The Secret of the Unicorn, Hergé was still very much attached to the original model for the building: the Château de Cheverny in the Loire Valley, France. This is why you may notice the disproportionate size of the cellars in which Tintin finds himself locked up. Hergé had drawn them to a scale to suit the château, which is bigger than the definitive version of Marlinspike Hall. Marlinspike Hall was inspired by two sources. It is similar in architecture to the Château de Cheverny, which dates back to the sixteenth century and was founded by the lieutenant-general and military treasurer of King Louis XII. Located in the department of Loir-et-Cher, not far from the town of Blois, the building was substantially renovated in 1634 at the request of the Count of Cheverny. Hergé had a tourist brochure for the castle in his possession. The front façade of Marlinspike Hall is modelled on the central part of the castle, with the two outer wings removed. There are several theories as to the origin of the name 'Moulinsart' (Marlinspike). One of these hypotheses traces the name back to Alive Devos, Hergé's first assistant who was employed to work on the project to colour in albums previously published in black and white (up until 1942). A member of her family had just moved house to Sart-Moulin, in Walloon Brabant. This is only a theory, but it seems a good one! The room from which Tintin telephones Captain Haddock is based on the king's bedchamber and the guardhouse at the Château de Cheverny. Since 2001, Cheverny has hosted a permanent exhibition dedicated to Tintin entitled: The Secrets of Marlinspike. On an interesting note, visitors can find Tintin's bedroom in the exhibition, which Hergé never actually portrayed in Tintin at all! Several ships were the inspiration for the Unicorn: experts talk of the ship called The Brilliant, built in 1690 by the master shipbuilder Salicon. But the figurehead of the Unicorn is based on that of the English frigate, The Unicorn, built in 1745. Others think that Hergé was inspired by the photo of a sailing ship which appeared on the front cover of a magazine published by the Belgian Ministry for Maritime Affairs in November 1936. While Red Rackham's Treasureintroduces a whole new dimension to the world of Tintin with a certain absent-minded new character, Nestor's memorable first appearance in The Secret of the Unicorn should not be forgotten. His defining character trait is obvious straight away: loyalty. This devotion, misplaced in the case of the Bird brothers, would be put entirely at the service of Captain Haddock. And for good reason: it is the Captain who pleads Nestor's case following his arrest by the long arms of the Thom(p)sons and in so doing secures his release (page 55). The Secret of the Unicorn introduces some fleeting characters typical of Hergé's profound imagination, and no less unique for their short stays: the Bird brothers, true twins unlike Thomson and Thompson, who are doppelgängers! Following their arrests, they apparently spend the rest of their days in prison, and yet these two dodgy antique dealers prefigure the art forgers found in the last unfinished adventure, Tintin and Alph-Art. Ivan Sakharine leads the string of characters who look like they may have a lead role, only to disappear off the page, having led us up the garden path. We find out that he has gone away (page 58), and after that we never see him again. His name is reminiscent of the war years, as saccharin was used at the time as a substitute for sugar, which was hard to find and expensive. The name of the obsessive-compulsive pickpocket, Aristides Silk, alludes to silk fabric, used to fashion ceremonial military gloves. In 1942, pickpockets were rife. Mr Silk's courteous personality was a refreshing change to the violence meted out by some thieves! If the real English pirate John Rackham (1682-1720), the subject of an article Hergé read in 1938, was the inspiration for Red Rackham, Hergé must have exercised a little artistic license: John Rackham was blond and, so they say, effeminate. 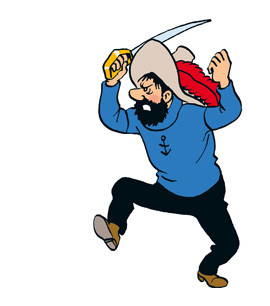 Hergé himself said that he was influenced by an engraving by the artist Rascalon, portraying Montbars the Exterminator, the merciless and bloodthirsty French buccaneer, who terrorised the Caribbean during the mid-seventeenth century. Red Rackham's imaginary family tree is enough to make your hair stand on end!